TOXIC STAPLE is a collection of over 60 stunning stories of renewed health supported with nearly 700 easy-to-read citations from significant research from around the world and my own slant from going to conferences and talking to patients, practitioners, and the general public. 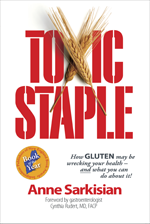 Read the strong endorsements (click Endorsements above) from those in-the-know who say doctors and health care professionals or anyone wanting to feel better should read Toxic Staple. Discover the power to transform your health and your life.